Since I started writing this blog a few years ago, my beer consumption has spiked. It's part of the deal. So one of the things I do every January is embark on a Tastes Great, Less Filling excursion. I figure it's the least I can do for my liver, which spends most of the year chewing on a steady diet of beer-based alcohol. This month I'll look for tasty, less filling options. Of course, Tastes Great, Less Filling was the slogan Miller used to launch Lite Beer in the 1970s. The concept of light beer wasn't new at the time. It had been tried for many years and always whiffed. Why? Because it was universally positioned as a diet drink, and very few self-respecting beer drinkers wanted anything to do with diet beer. Miller turned the tables with an ingenius advertising campaign that positioned Lite Beer as something that tasted great and didn't fill you up. The idea was you could drink a lot more of it at home or at the bar. Sports stars and other celebrities hawked Lite Beer in popular TV ads. It was a gigantic success for Miller, so successful it launched the light beer category. Other brands soon followed with their own light beer. They had to. 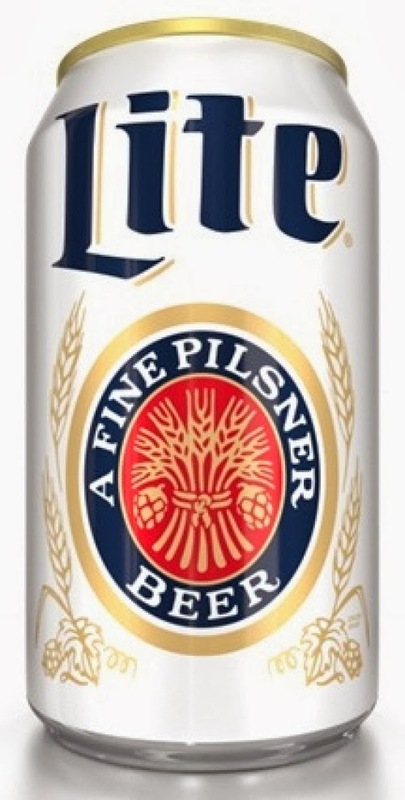 MillerCoors, which has had a tough year, just announced that Miller Lite will be available in a limited edition, retro can from January through March of this year. The original can was white with hops and barley graphics, and the words "A Fine Pilsner Beer." I don't know if they use hops and barley in Miller Lite these days, but never mind. The can is iconic. Miller Lite likely won't be part of my January program. I'll look for craft beers that fit the tasty, less filling montra. I've talked about low ABV beers before. It sometimes irks me that so many craft beers are 7% or higher. Such beers were not the domain of the early craft brewers. But there has been a sort of creep toward higher ABV beers in recent years. It is most definitely possible to make a great beer in the sessionable 5% range. I know because I've found many of them over the last couple of years. The first one on this year's list is Ching Ching from Bend Brewing. It clocks in at 4.5%, about what you'd find in a can of standard Budweiser. And that's where the similarity ends with a jolt. 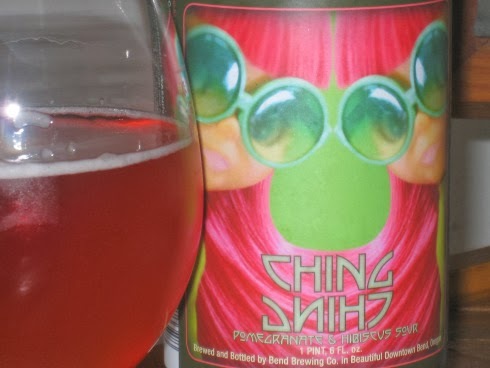 Ching Ching is a mildly sour Berliner-Weisse made with pomegranate juice and hibiscus. It was Tonya Cornett's recipe when she was at Bend Brewing and won a gold medal at the 2012 World Beer Cup. This is a fantastic beer, brilliant pink in color, luscious in flavor, yet intensely light. It fits perfectly with my January program. The biggest problem with Ching Ching is it's hard to find. They had a keg and some bottles at Tin Bucket last week. The bottles were gone in hours, two of them landing in my fridge. I can't say how long the keg lasted, but almost everyone at the bar was drinking Ching Ching when I was there. Jump on it if you see it! I'll be posting other finds from my annual Tastes Great, Less Filling tour through January. Stay tuned.